Today is such a pretty day I had to spend some of it outside. Here is some of the white that I encountered. Bridalwreath Spirea, Spiraea prunifolia. Super shrub. While trying to get a good photo of some of the ferns unfurling a Snowy Egret landed in the creek to fish for dinner. I got to get a little closer (of course the lens I had was for macro shots, not the best for zooming in). Spooked, it took off to find dinner further up the creek. 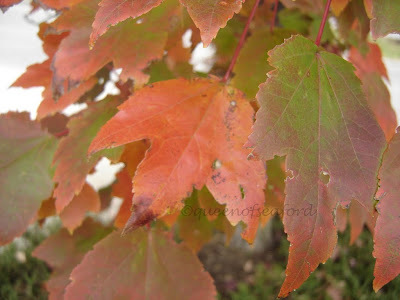 Red maple is one of the native maples to North America, with its native range well north of the Great Lakes and south to Florida and reaches west to the Mississippi save the region of central Illinois. Its adaptability to various soil types and moisture needs allows it to grow in a wide range of zones. According to Silvics manual if it is in a good location it can be a fast grower. It is a nice shade tree as well as being shade tolerant. The Red maple goes by many other names- Carolina Red Maple, Drummond Red Maple, Scarlet Maple, soft maple, swamp maple and water maple. Given its wide range of habitat many common names have been given. 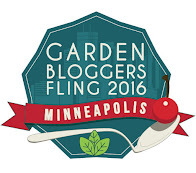 Here is a good example of the need to use botanical names when discussing plant material. An average tree grows to a height of 70 feet though some can grow to over 100 feet tall. It is a medium aged tree –not living more than about 150 years. The overall shape of the tree is pyramidal when young becoming more oval as it matures. 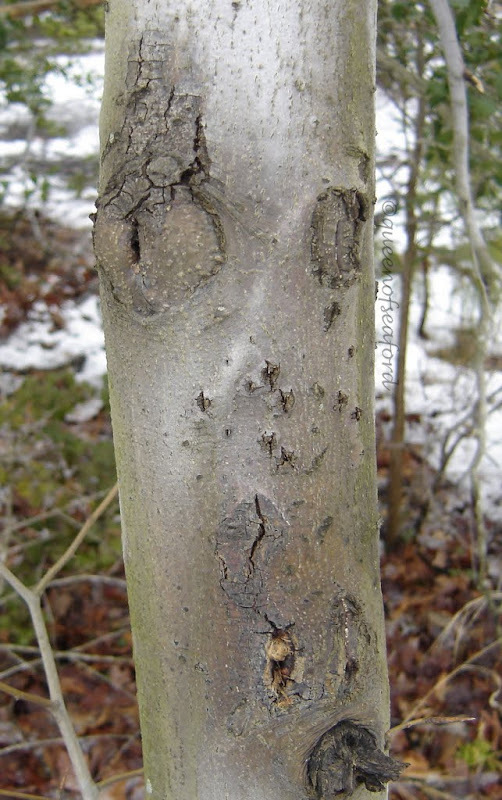 The bark is smooth when the tree is young gradually developing ridges or scales. 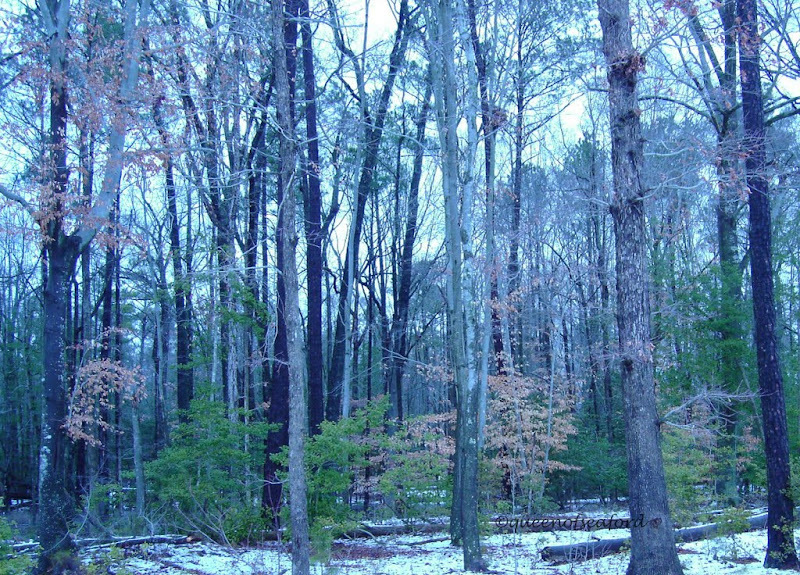 It is light gray to brown gray on mature trees. One of the interesting features of this tree is its reproductive characteristics. It can be either dioecious or monoecious. 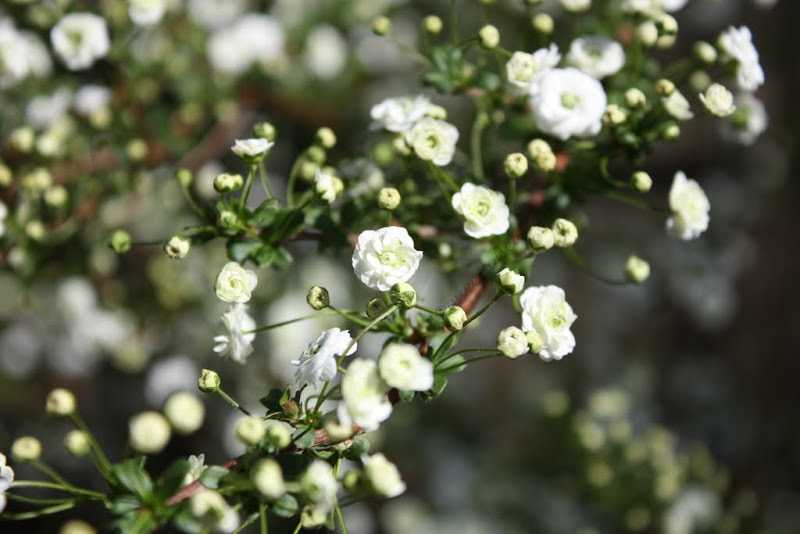 If monoecious the male and female flowers occur on different branches. The Missouri Plants web page shows a great example of the male and female flowers. 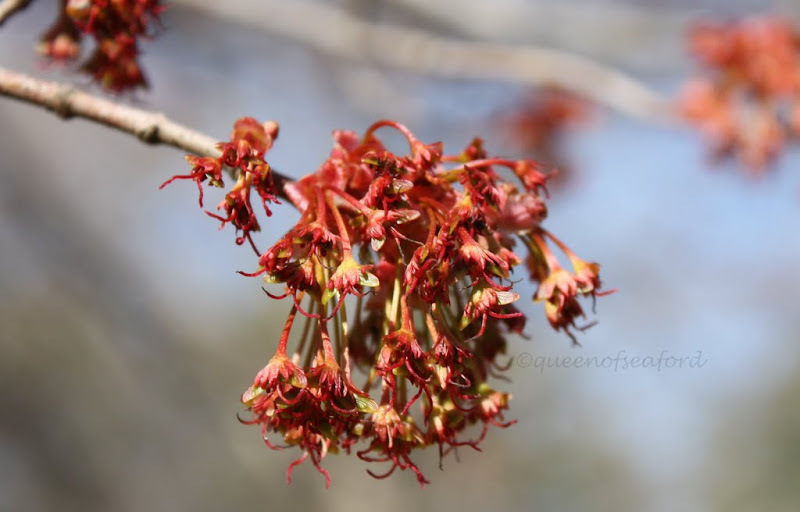 The A. rubrum is apparent in the spring as one of the first flower buds to appear in the woods. The red stands out against the otherwise brown/gray limbs of the deciduous woodlands. This is the time that the vast number of Red maples really stands out. After the flowers the seed pods, samaras, form. On the Red maple these are most often red in color. The UCONN web site has some great photos of the samaras. 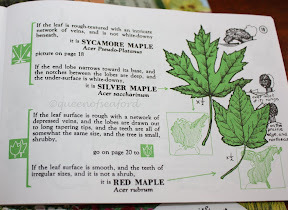 The leaves are one of the identifying characteristics of the Red maple and compare very closely to the Silver Maple, Acer saccharinum. While trying to gather photos and make some IDs of trees I was getting confused with these two. After reading through the Silvics manual I find that Red and Silver will hybridize naturally. One of the best sites to compare all the maples is the Vanderbilt site. 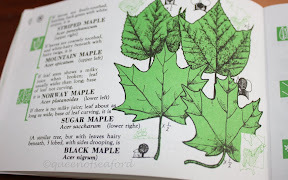 From this site you can click on each maple individually. 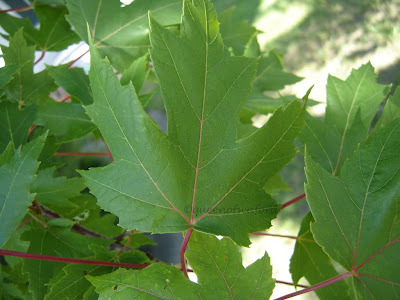 The Red maple leaf has more of a 'V' shaped notch between the lobes than others that are 'U' shaped. 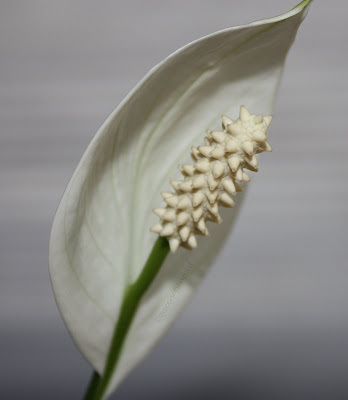 It has 3-5 lobes and the leaf is smooth with double-toothed margins. It is a light green with a whitish green on the underside. Its stem is usually red. 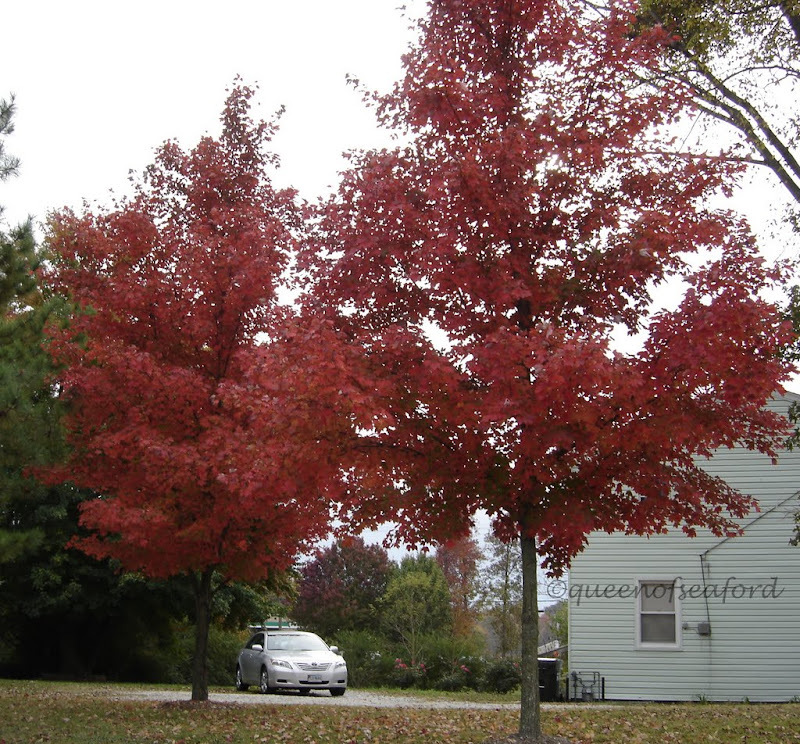 Fall color is especially grand with the Red Maple. It is one of its outstanding characteristics. The bold color ranges from orangey red to brilliant red in the fall. This is not the primary tree that is used in syrup production but it does produce a sweet sap. Because it leafs out so much sooner than other maples it isn't used as much. Apparently the leaf production changes the flavor of the sap. Other uses for this tree include furniture though it is not as hard as other maples. The bark has a history of being used to take care of coughs and diarrhea, also a blood purifier. Other good references include NCState and Virginia Tech. Next week's tree is the Persian Ironwood. Hooray for Jane and a Trip South!! 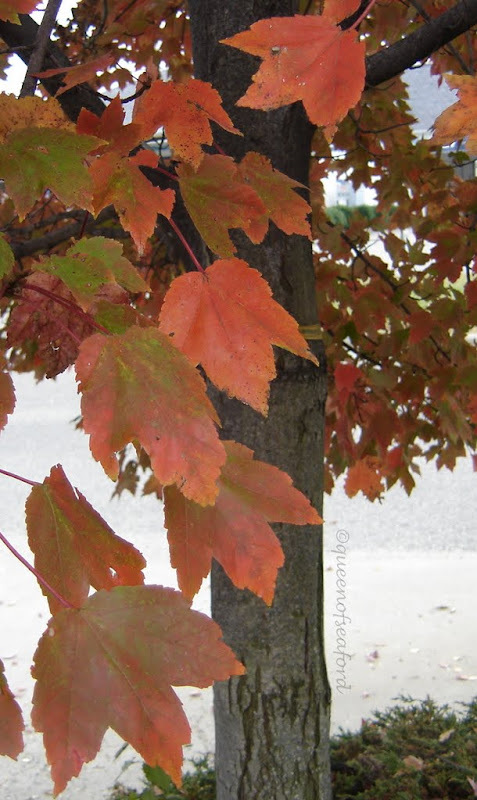 I know that I owe everyone a posting about Red Maples for the Tuesday's Trees series, it will come. It has been an incredibly busy time. I think most everything is in a 'ready' state for the house to be on the market. Saying that, I will note that today is a very rainy day and I do have three dogs. 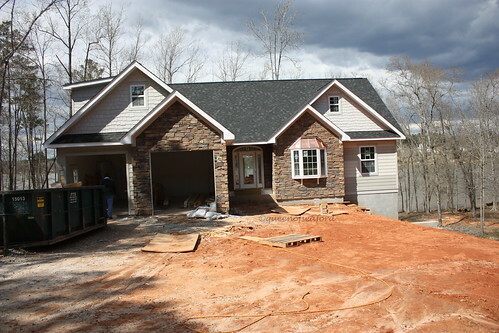 We ran down to South Carolina over the weekend to see the house and are getting more excited about the move. 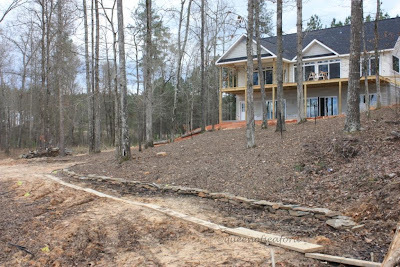 Here are a couple pictures of the progress. 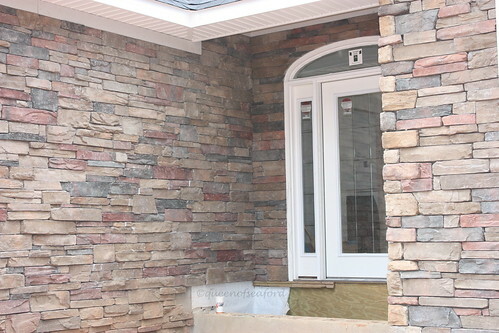 The stacked stone came out very well! 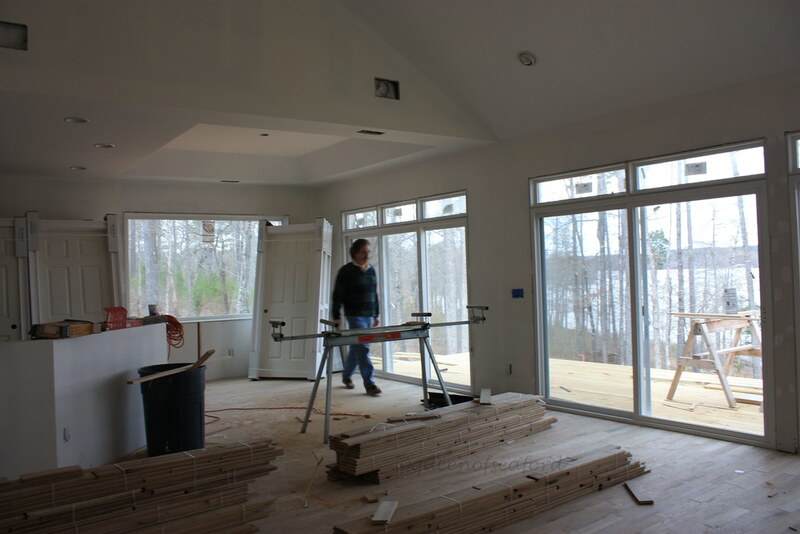 And for those who want to see the view....... we have lots of windows ---all overlooking the lake. 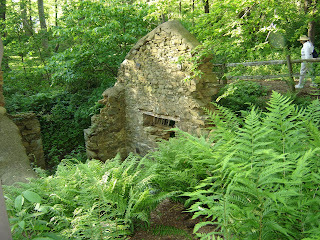 This is another view of the gardens (above the stacked stone) and the sod area. When we got home I was pleased to see that more of the garden had popped open in the matter of a couple days. My Magnolia x 'Jane' is in full splendor. Having fun with the photos....I took a nice photo of Jane with the Spirea 'Goldflame' behind it. A really nice photo in its own right. Then with a little color saturation I ended up with an electric bloom! I have had trouble with my online Picasa album today. Hoping the gremlins will go away so I can post the tree article tomorrow. Anyone else having issues? 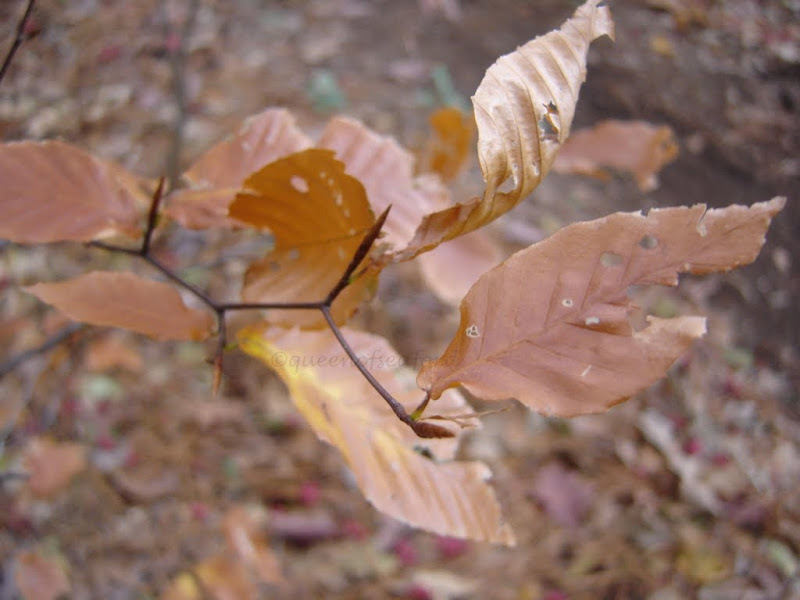 Beech, birch, elm….when I started my knowledge of trees journey these confused me. I won't lie, some still do. I believe I can make the ID of Beeches, at least American Beeches. I first noticed this tree last winter. If you look through the woods in my area, you see little ghost-like leaves of beige/tan hanging on throughout the winter. Along the Colonial Parkway there are many groves of beech, some very mature specimen surrounded by smaller ones. 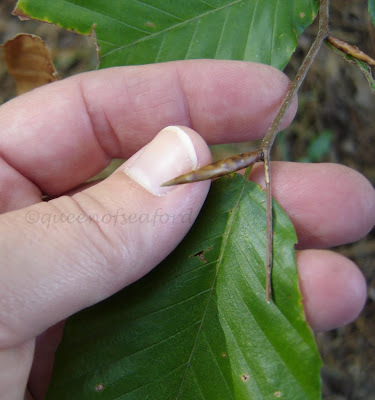 While reading Lisa's blog, Natural Gardening last year she did a post about American Beech. AHA!! The quest for more info begins….. While talking to my friend David, asking about other trees and trying to make an ID in the Learning Garden he showed me how to tell an American Beech…one way. 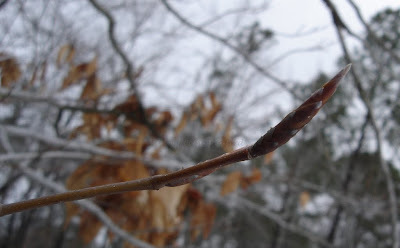 The leaf buds are like tightly wrapped cigars. Each and every Beech I looked at had this feature. 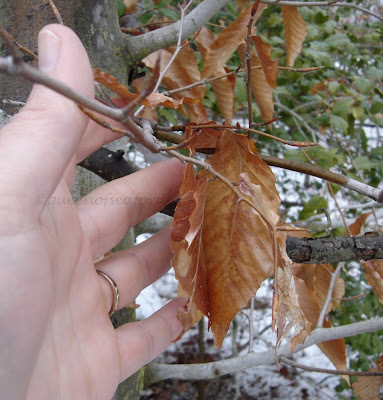 The leaves on the American Beech are oval, 3-5 inches and more than twice as long as they are wide. This is a contrast from the European Beech. 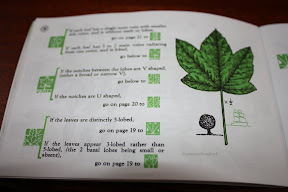 Its leaves are 2-4 inches and not even twice as long as they are wide. The toothed margins are also different. American has more conspicuous serrated margins. The American Beech leaves emerge in the spring and the lovely little ghostly leaves drop. 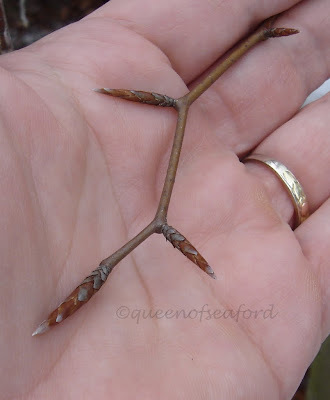 Twig growth is a zigzag pattern and at each node there is a bud. Fall color is yellow turning finally to the light tan color throughout the winter. 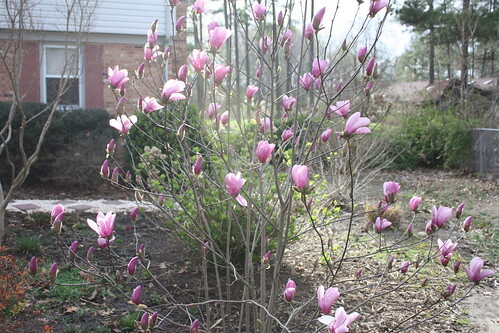 This tree can be found mostly in moist soil conditions, bottom lands and wetland areas. The bark on this tree is smooth, older trees may have been scarred by young lovers carving their initials into its bark. One story of an old old Beech is that of Daniel Boone carving his initials and his claim of killing a bear on that spot. The Filson Historical Society of Louisville now has this trunk, according to Wikipedia. According to Silvics Manual, my favorite reference online for native trees, while the average age is ranges from 150- 250 years there are trees found in Pennsylvania older than 366 years. 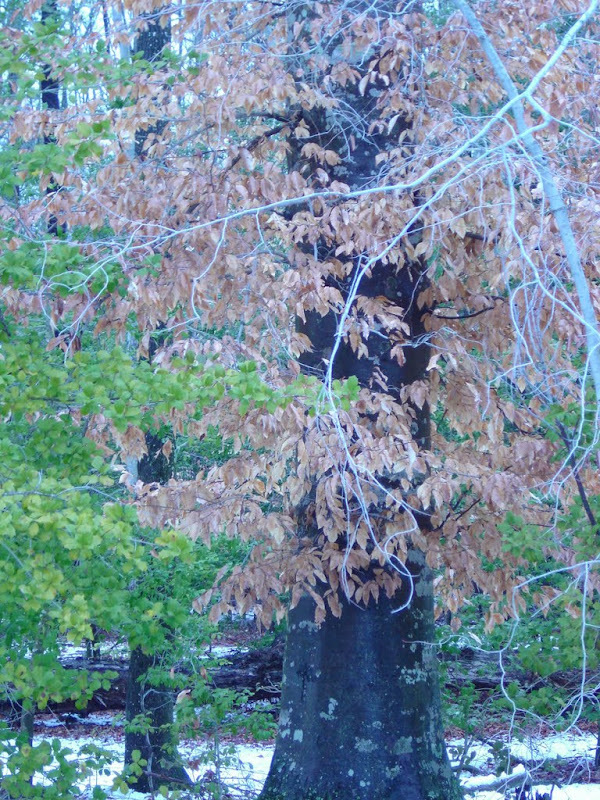 One of the largest beeches is found in Michigan – 161 ft. tall and a crown of 105 ft. The average size is 60- 80 feet tall and a trunk diameter of about 2-3 feet. 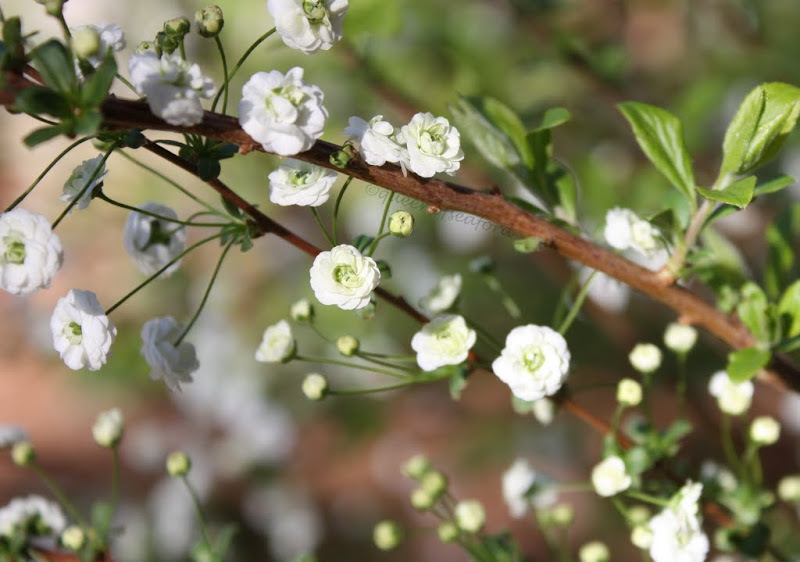 Fruit and flowers- male and female flowers occur on the same tree but in separate clusters. 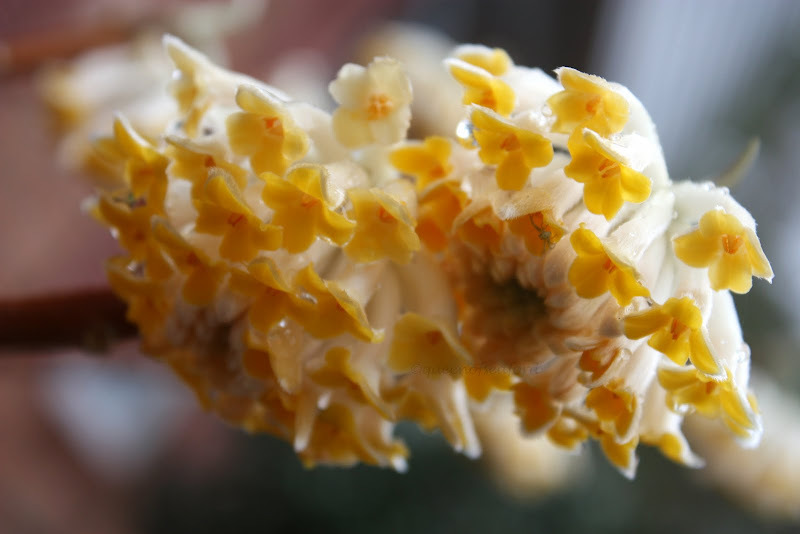 The male flower is long stemmed and female flowers occur in clusters of two to four. Interestingly the Beechnuts take an entire year to mature and ripen in the fall. A Beech does even produce until it is fully mature, having a good production finally around 40 years of age. Seed production goes in 2- 8 year intervals. A chilling period is required for a Beechnut to germinate. The seedlings develop best under a canopy or a protected area. The fruit is a great food source for many birds and animals in the woods. Beech wood is used in many applications- from furniture to railroad ties. It is a dense wood and therefore is a good fuelwood. Thin strips are used as veneers or in basket making. Because of the thin bark the Beech can have problems with many sucking insects. Beech is not top of the list for white-tailed deer---nibbling it only if other food is not available. Far more information is available at the Silvics Manual link and for some good photos of the flowers and the nuts see the Virginia Tech or Wildflower web site or the UCONN site. 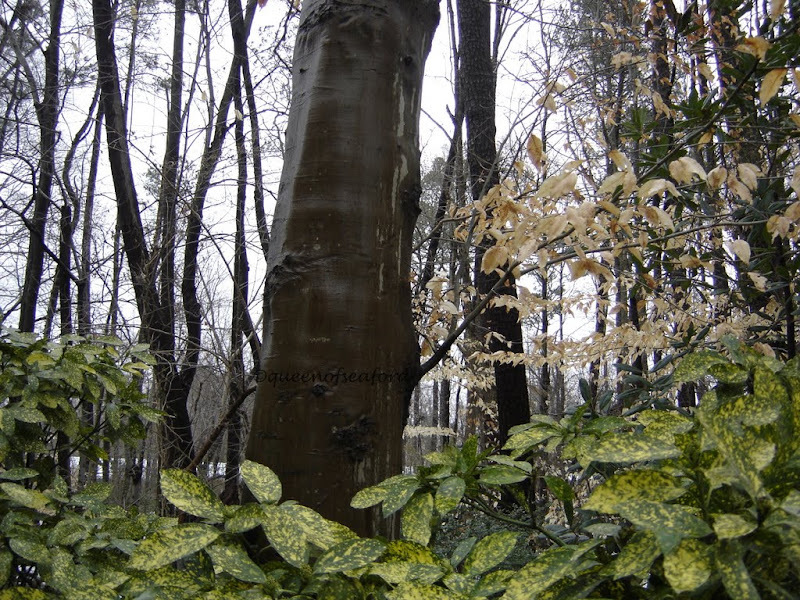 I am including a picture of a Tri-Colored Beech- a European Beech, Fagus Sylvatica 'Roseo-Marginata'. It is zone 4- 7 and therefore not likely to be found here in zone 7b. 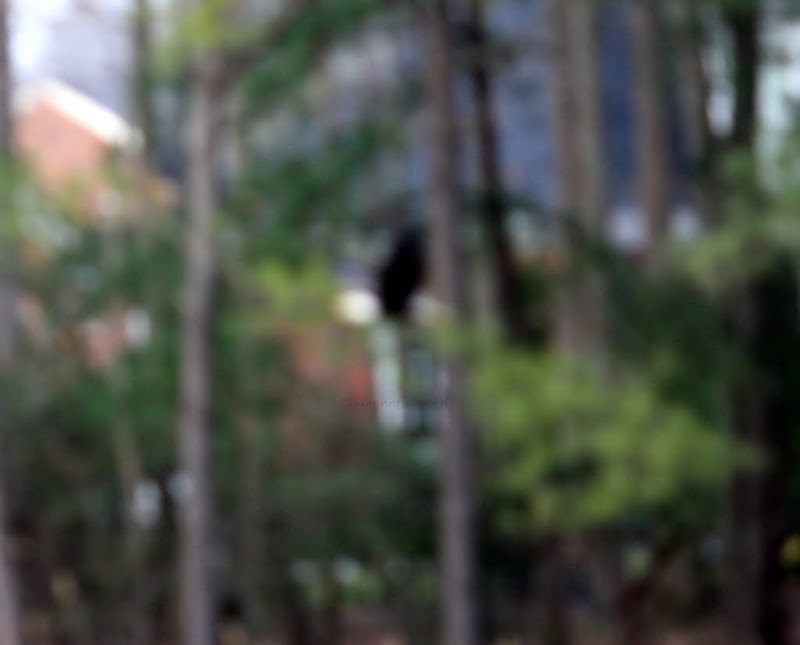 This was taken on the campus of George Mason University in Northern Virginia. Notice the more rounded nature of the leaves. This picture was an ID challenge from one of the kids. I will keep the words to a minimum today. Just wanted to share the blooms in my garden for GBBD as I missed the last few. 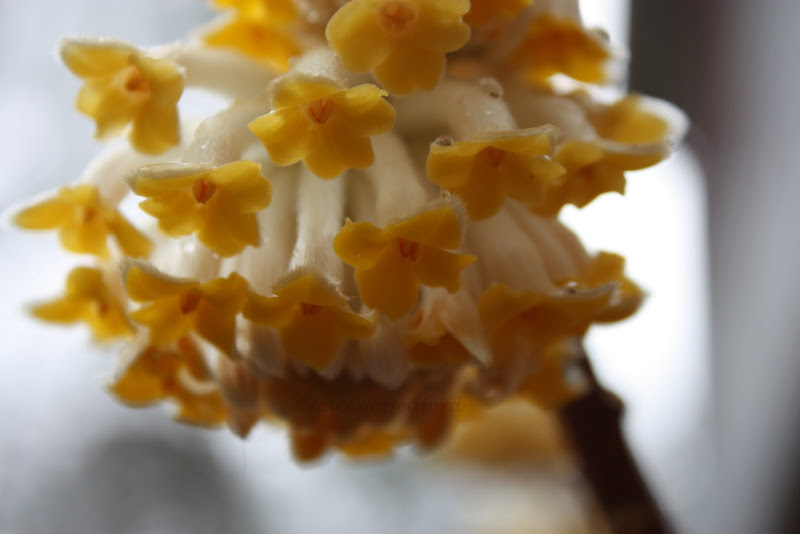 By my front door is the best thing next to a Daphne Odora --Edgeworthia chrysantha (which is in the daphne family). Also near the front are a newly planted group of pansies. 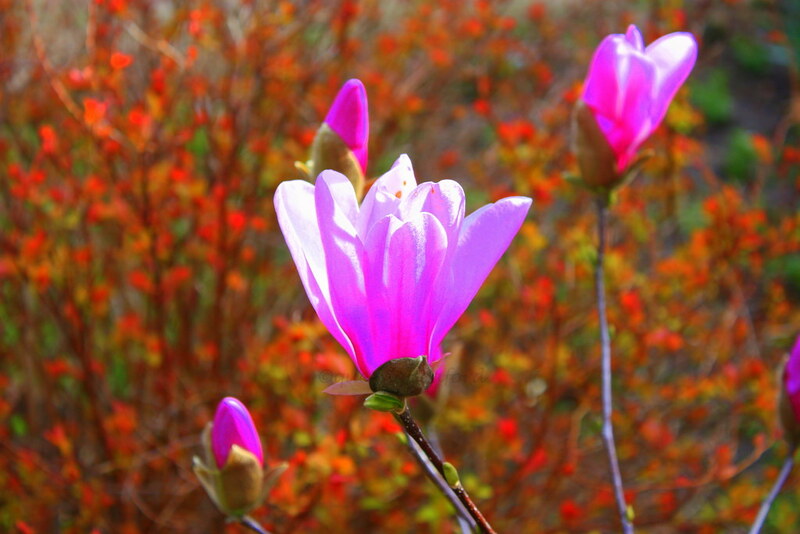 While this is bloom day, I do have to share some color in the garden from new growth. 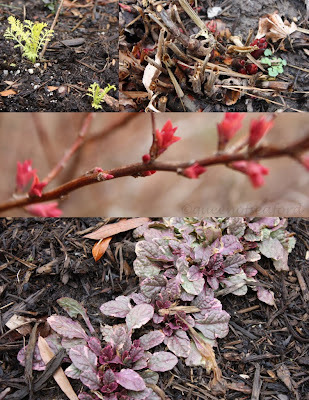 The Ajuga 'Burgundy Glow', Tansy 'Isla Gold', Spirea 'Gold Flame', and buds of a peony. Indoors I have a few blooms as well. 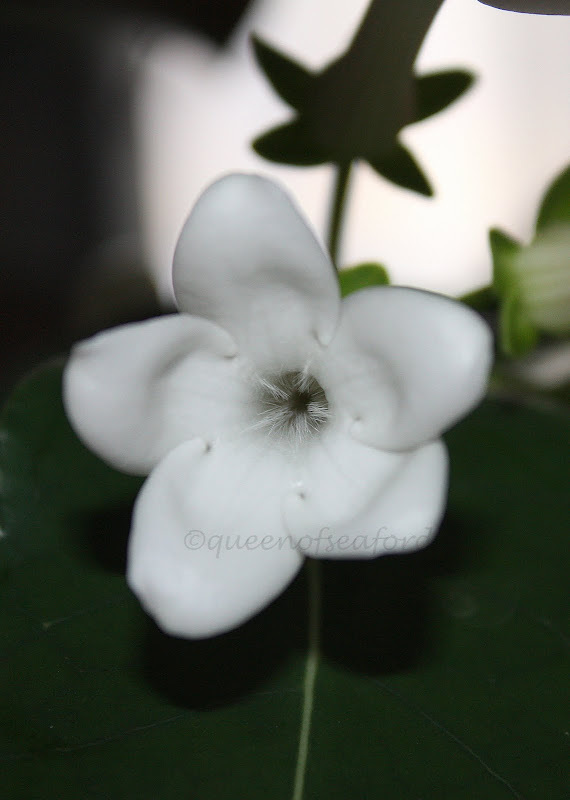 New to the mix is a Madagascar Jasmine, Stephanotis Floribunda-- very fragrant, ok, and an impulse buy. And a couple reliable bloomers-- a Peace Lily and African Violet. 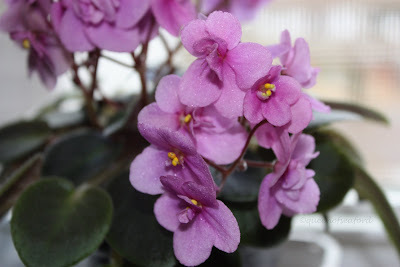 Stop over to Carol's blog- May Dreams Gardens for more Bloom Day postings. I will stop by and see as many as possible tonight. Happy Bloom Day!! Awakening and Lessons Learned or Were They? 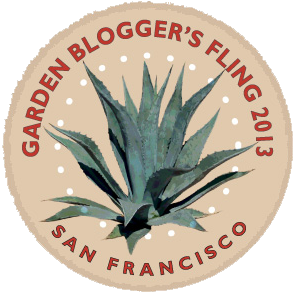 I have been absent for a little while in the blogosphere. I have been busy with the prep work for getting the house on the market. We have had inspections and realtors coming through. I have one more appraisal tomorrow and then I think it will be on the market this week. So far all the inspections have been positive. Hooray!! 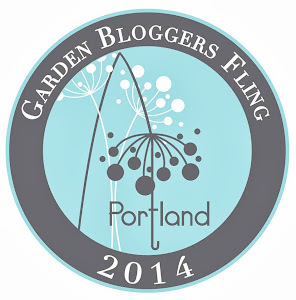 This month's Gardening Gone Wild photo contest theme is 'Awakening'. 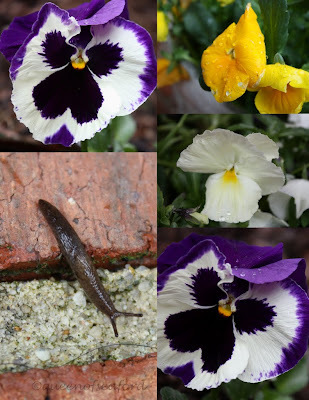 As the weather has been milder this week, there is a good deal of awakening going on in the garden. 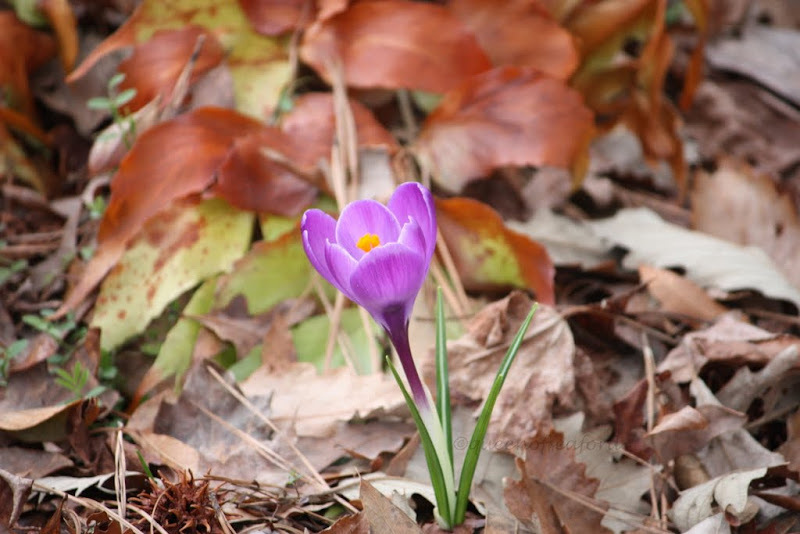 This was taken in the Learning Garden on Thursday -- the light seemed to make the crocus just glow. And to the lessons learned. This past week my mom called me in the morning to say there was a Bald Eagle on the dead tree across the creek. I was sitting down in the kitchen and where was the camera??? Yes, upstairs. And did this camera have its new lens that is a telephoto lens on the body of the camera?? Of course not. So I quickly changed lens and ran to the window in our bedroom, hoping the eagle was still perched on the tree. Was he still perched??? You guessed it! 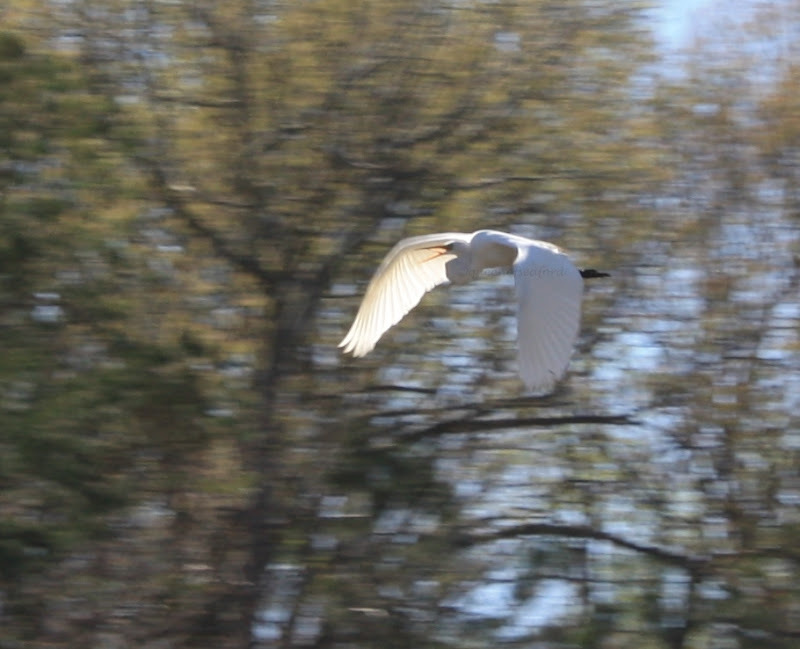 He had taken flight and this is all I got. One would gather from this experience that I would have my camera on hand at all times. HA!! Driving to the commissary today I saw the prettiest blue wildflowers along the roadside, at a place I could have easily stopped. Where was my camera??? Right, it was home. Will try to carry the camera with me more often. Now that we are having the house up for sale, the rooms are staged a bit. My fast computer is upstairs on a desk in my daughter's room. The ease of jumping from one post to another isn't quite at my fingertips. I have a little netbook, which is very nice to use, but I am still trying to get the hang of the touch pad. Please bear with me as I try to visit your blogs, I have been trying to catch up a little today. With hope I will have gone by and said hello to most of you within the next few days. I also will have Tuesday's Trees back on track. I want to do my research and photos for these posts without rushing too much. Again, the next tree is the American Beech. What kind of Storm Booty do you have? What? You don’t have any? Well, it is one of the perks living on the water. 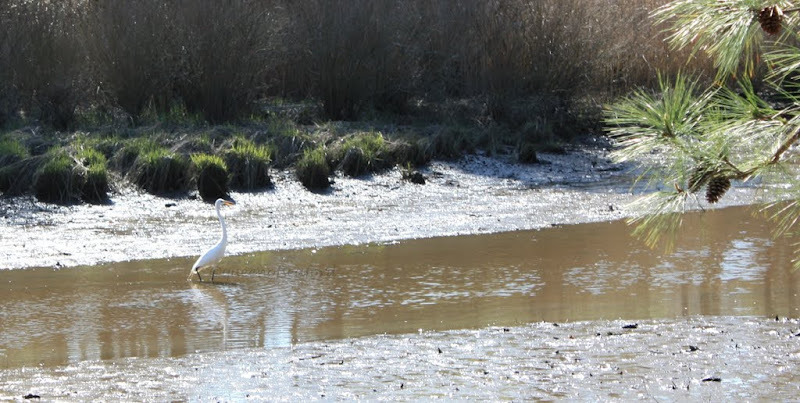 Tidal water brings and takes. My first experience with the give and take with storm booty was about 16 years ago. We had just come back from the vet, Monroe was just a puppy and got spayed. We took her to the backyard to let her off the leash only to see the Little Tikes turtle sand box, filled with sand, floating out to sea. The tide was high with a nor’easter and the turtle was floating as tide went out. Luckily I was able to grab it and pull it back to higher ground. Fast forward many years to 2003. Hurricane Isabel hit our area with lots of water. 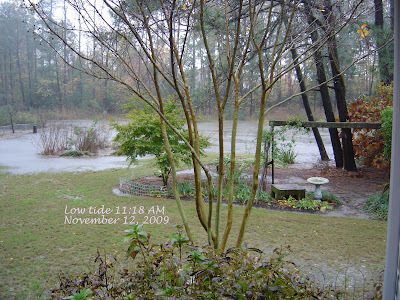 Once the tides had subsided we took inventory of damages and the condition of the trees and bulkhead in the backyard. Lo and behold---we were the proud owners of two pressure treated structures. I am not sure what they were. My guess is that they were steps from someone’s dock/decking area. Whatever they were, they became two garden tables in my yard. They were strong and could take the weight of some of the larger containers I had. It made for a nice addition to the backyard. I put it in the bed with the birdbath. Here it is just before the last nor'easter. A few years after Isabel we had another nor’easter and one of the tables floated off to a new home. My neighbor across the creek was now the proud owner of a small table that they could use in her yard. She asked if I wanted it back, but I said it was now hers. I placed the remaining table back where I wanted it…creating a new setting. The past few years we have had many nor’easters, some worse than others. 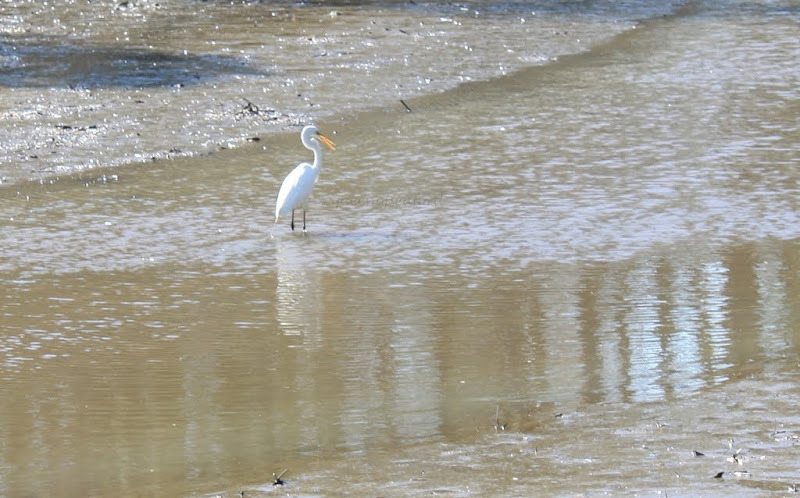 This past December you may remember my post about the high water. 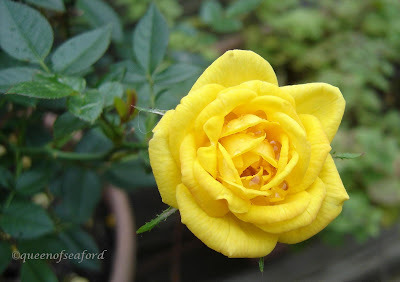 I was sad as the cute little yellow rose was sitting in the yard floated off the bulkhead as the tide receded. We had just had the house and deck power washed and all my plants that were on the deck were now sitting in the yard. Gaining and losing storm booty is standard fare, but I liked that little rose. The next day I found the rose had floated back into the grasses along the bulkhead. I was happy to rescue it! 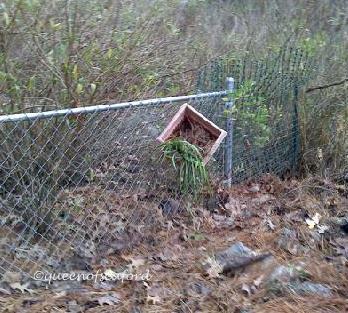 After the storm I found another planter had floated through the yard and was caught up on the fence. Later that day I was talking with my mom (who lives next door) and she asked if I had lost a banana tree. what??? No, I didn’t have a banana to lose. Well, new storm booty! 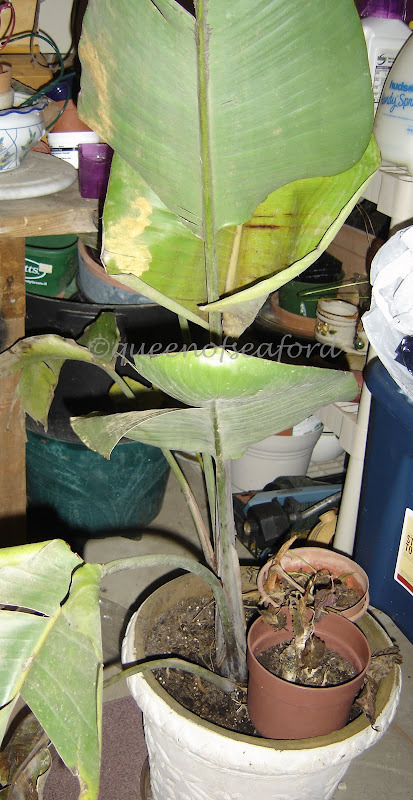 Mom didn’t want the tree, so now I have a banana tree…..currently residing in the garage ‘til next spring. For now I am happy to be done with storm booty coming or going.